David Law is within touching distance of realising his dream of a European Tour card, 15 months on from the premature death of his first child. 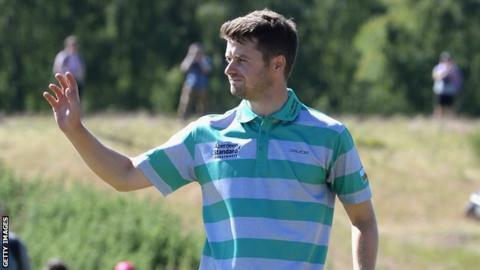 The 27-year-old is one of four Scots in the top-15 qualifying spots before this week’s Challenge Tour Grand Final. Law feels his perspective has changed since his son was stillborn. Law is currently 12th in the Road to Ras Al Khaimah rankings, with fellow Scots Grant Forrest (eighth), Liam Johnston (10th) and Robert MacIntrye (13th) also currently in the qualifying spots. If they remain in the top 15 after the finale at the Al Hamra course in Ras Al Khaimah from Wednesday, 31 October to Saturday, 3 November, they will secure a place on next season’s main European Tour. “I would be pinching myself for sure,” Law said. “It would mean everything for me and my family. It has been a dream of mine since I was 15. “I just need to go out and try and do my best to win the tournament. “There’s a few things that could happen. I could finish last and be OK. I could finish 20th and not be OK, so the easiest thing for me to do is to go out and finish as high as possible.